I can't seem to focus on Hobbit. Sorry. It will be done when it will be done, and that's all I'm saying about it for now. In other news, our page has reached over 100 likes so hurray for us! Because of this I am rewarding you guys with ANOTHER story I finished just now. It's just an episode, a scene, and I won't promise that will be anything more than that (even though it might). To clarify why I picked this subject (as if it wasn't obvious by now), I will say this: I LOVE STAR WARS! I've adored the series ever since I have first seen the movies as a kid and, just like any self-respected geek, I've played all the games related to The Saga, starting with the old Dark Forces, continued with Jedi Knight I and II, Academy, Outcast etc. until Lucas Arts' latest production: The Old Republic. T.O.R. is a beautiful M.M.O.R.P.G. that I've purchased on my birthday, immediately after it was available in Romania, and which I stormed through all the way to level 50 in just a few weeks. I've started countless characters just because I loved the story lines of each class - this game has managed to bring the player a whole new type of experience: making you feel like your character is not just another nameless individual, but an important part of the Star Wars universe. Even though it's not nearly as refined and smooth as World of Warcraft, T.O.R. is still worthy of praise for its incredible graphics and differently awesome gameplay, and as gamer for the past 22 years I strongly recommend it. If you're a W.o.W. fanatic (like me!) you may feel slightly disappointed by the lack of features, but as you advance, you'll notice that BioWare has done a great job compensating in other ways. And, I'm certain, in time, T.O.R. 's patches and updates can even beat W.o.W. 's game experience. Long story short, I miss playing this game and felt like writing about it. I hope you enjoy! DISCLAIMER: I've just finished writing this so I do apologize for any mistakes regarding the phrasing. I am posting it as it is for now and will correct it sometime later today. Chain lightning struck the horizon, over the thick jungle and the untamed wilderness beyond the city walls. Terrible beasts prowled the in darkness, unaffected by the constant electric storms that ravaged Dromund Kaas. Somewhere a slave was being ripped to pieces by a pack of giant reptiles – just like any other night. No Sith nor slave cared. The savage forests of Dromund Kaas were endless labyrinths filled with danger. Just being there was a constant struggle for survival and, like the Sith philosophy said, only the fittest made it through. In truth, there was no place on that world that wasn’t an actual deathtrap; from the outskirts of Kaas City to the highest tower in the Sith capital, any and all men had to tread carefully just to make it through the day. The air buzzed with the energies that were flowing through the core of the planet and up, spreading across the surface like a giant spider web, and the terrifying spirits were constantly restless. For the Sith, not even the Jedi Temple on Coruscant seemed as threatening as their own glorious Kaas; a giant city made from more metal than stone, built one either sides of a bottomless ravine, casting its sinister shadow over the land, like a testament of what true power was. Dromund Kaas itself was being warned that no matter what dark champion it would spawn, it could never rival the power of the Dark Side’s most perfect children. Half of the stronghold was on one side of the rift, were the lower class congregated and went by their tough lives, doing their part for the Empire. It was no different than any other place in the galaxy, tainted by vice and corruption and petty crime, despite the titanic statues and the magnificent symbols of the Sith that adorned the plazas and markets. In reality, that part of Kaas City could have been just as well part of Coruscant; Republic or Empire, dirty credits didn’t care who handled them. The other half was on the other side, where the Mandalorian Enclave, Sith Intelligence and the offices of the diplomats and lords had been built into three enormous black towering buildings, connected by ramps and bridges. It was there that true fear could be sensed along with true power… and true corruption. The drug peddling, prostitution and bribing on the other side were nothing compared to the power plays and blackmailing and (more or less successful) assassination attempts that could be witnessed here. Not a day went by that an apprentice didn’t become a lord and a lord didn’t become a Darth; the only thing that remained constant were the few dreaded members of the Dark Council and the mysterious Emperor who went into seclusion and allowed no audiences at all. 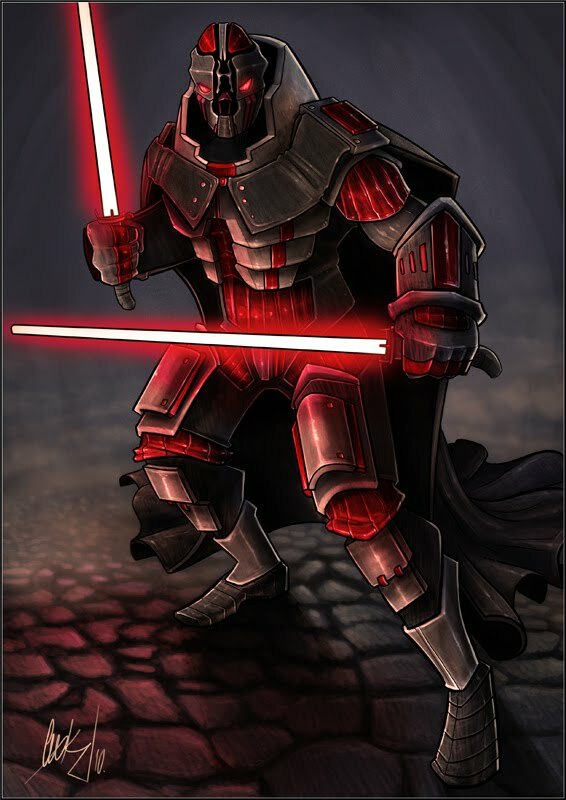 Just as common was the terror of the average Kaas inhabitant – that of the harsh laws, the scary Imperial Guards, the corrupted imposing military forces, the secretive and manipulating agents of Sith Intelligence or the passing lord who might tear you apart simply because you crossed his path. One could have his pick. One considered it routine to fear and so, ironically, the concept became obsolete in a way, thus challenging the Sith for new ways to induce respect and bury obedience deep into the hearts of the Empire's citizens. Yet in the process, the ruling class had to also be on the watch for traitors among their own; a Sith never knew whether the person next to them was friend or enemy. Another series of flashes lit the darkness above, revealing the outlines of heavy clouds. There was no thunder, as the storm roared its fury beyond the mountain range. Just as silent, a slim silhouette leapt from one of the lesser structures, boosted by the jetpack on its back, leaving an almost indistinguishable trail of blue light behind. The assassin was skilled – he dodged the security drones with perfect timing, staying out of their path and timing his moves with perfect precision. The hovering robots were scanning the tower in an apparent chaotic pattern, but an expert infiltrator could tell how they were “thinking”. Their programming was limited and their weapon systems even less of a threat, but it only took one split second to be noticed and two security hover crafts would fly in and dispose of any trespasser. The Mandalorian Orrin spent an entire hour observing before he made his attempt. It wasn’t his first mission against Sith, but he had never gone against a Dark Council member before. Specifically, against Darth Marr, one of the fiercest and most powerful lords. Orrin considered it a privilege and an honor to take on such a foe; just like all Mandalorian mercenaries, he followed the warrior / hunter code and wasn’t afraid to die. Clad in his black light armor suit, the assassin made good use of his stealth techniques and equipment, cloaking, slipping by the security with ease. For a moment he even allowed himself to think it would be less difficult than he had originally imagined and, perhaps, all there was to this Dark Council was their reputation. And what better way to discourage others than by whispering macabre tales about how nigh invulnerable and ruthless and pitiless the Darths were? Had anyone actually witnessed their sadistic methods? Orrin was hopeful, but not stupid. He focused back on the mission. Cutting a hole in the glass wall outside with his laser tool, he sneaked inside unnoticed. Unlike most Mandalorians, the assassin was quiet and subtle. Not the typical heavy armored trooper the Empire used as cannon fodder, but more fitting for Sith Intelligence, as he specialized in sabotage and effective elimination. The inside of the housing tower was lavish and well lit, lacking any good hiding spots. From this point on he had to change strategies and his approach had to become a more direct one. Aside from the droids and drones and security teams, the lords’ building was also guarded by Sith apprentices who, despite their limited knowledge of the Force, could be quite deadly with a lightsaber. Orrin grunted in disapproval as he realized he had made a mistake. He ended up in the lobby on the 57th floor, just one level down from where his target was. The virtual blueprints confirmed it on the electronic visor of his slick full helmet. The armored pad on his left arm popped open and he typed fast, looking for the fastest and safest route up; going back outside now would be foolish and dangerous, and he decided to take his chances through the vent system. Just around the corner, a corridor guarded by two Sith led to one of the main elevators, but that would have been suicide. The assassin dropped his jetpack and hid it behind a bench, then proceeded to remove the panel leading to the ventilation tunnels. As he removed the metal plate, the red lights directed him upwards and he slipped inside, pushing himself quietly against the tunnel’s walls. He climbed slowly, patiently, thinking of nothing but his mission, crawling through the vent and reaching the next floor quickly. As he peeked through the barred grate in the wall, he noticed the a hooded grey silhouette in a long robe, standing guard. By the clothing style and markings, Orrin could tell it was a sorceress. His gaze narrowed in tension, fearing that such a Sith could sense him without even looking, yet she didn’t seem to notice the Mandalorian. The killer produced a small pistol and aimed through the bars. The shot was silent and the dart hit its target accurately, knocking her off her feet. The guard fell dead without a sound. As he sneaked out of cover, Orrin pulled the body out of sight, near the gray metal wall, and rechecked his route. Again, a similar corridor as the one beneath was behind the corner. He approached the door and connected a wire to the general security system, scanning for any active alarms. As promised, his employer had the systems shut down and the video feed revealed a pair of Imperial Guards clad in crimson armor and wielding long vibrospears. They blocked his way to Darth Marr’s quarters. For some reason these red warriors were worrying him more than any Sith lord. Something about their uniforms was strange and unnerving. They were wearing long robes with heavy reinforced chestplates, elbow-high gauntlets and their full helmets had a crest on top of their heads, looking like an axe’s blade. Even the spears were a strange choice of weaponry and they only guarded the Dark Council and the Emperor. Orrin could only guess what lied behind those threatening helmets. He hacked the door open and tossed in a spherical brown sonic grenade. Before they could even react, the explosive detonated quietly, the high frequency noise deafening them for just two seconds – more than enough time for Orrin to aim at their legs, less protected, and shooting the poisonous darts with two well-aimed shots. Just one more to go, he told himself and hurried to the tall, thick plated grey door. The assassin prepared a smoke grenade and took one last glance at the security key card he received with his contract. He plugged the key in and the door slid inside the wall. His helmet’s visor switched to thermal vision, Orrin tossed the grenade inside, filling the dark room with smoke as he carefully stepped inside, keeping low and readying a second blaster in his other hand. Nothing. The room seemed empty and dead. His scans revealed no heat in the other three adjacent room either. He felt stupid. “Who sent you?” a male voice asked from nowhere and everywhere. Orrin panicked. It wasn’t a Mandalorian trait, but he couldn’t help it. He turned in a circle, trying to cover his back and figure out where the voice was coming from. There was a pause, as if the hidden watcher was pondering the words. A round metal chair flew across the room and smashed into Orrin, sending him flying across the spacious room, making him drop his guns. From above, a silhouette dropped down to the spot where the assassin was just a moment before. The light came on and Orrin switched his visor’s thermal mode off, fumbling for his large vibroblade as he rushed back to his feet. “Your employer’s name,” the man said and cracked his half-gloved fingers, and Orrin could finally see his opponent’s face clearly. The Sith didn’t seem scary at all. He didn’t wear a sinister cloak or a scary skull-shaped helmet, and his armor was just a black leather body suit with red v-shaped patterns on it. The only metal plating the Mandalorian could notice was on the man’s wrist pads, on the leg protectors of his boots and on his young face. He didn’t seem to be older than 25, with dark red spiky hair, and skin too fresh and white to be a seasoned warrior. He was unmarked by scars of torture, but cybernetic enhancements that gleamed metallically in the light. Subtle circuits blazed upwards on his neck and followed his jaw line to his chin and ear. “So be it then,” Katon replied and brandished his twin lightsabers. The laser blades slid elegantly with the specific buzzing sound. One blood-red. One midnight blue. The Mandalorian widened his eyes. “I am the Wrath guided by the Hand of the Emperor,” the Marauder said. “Consider that I’ve granted you the honor you asked for,” he added and threw the weapons at Orrin. His reflex was to block the spinning sabers, but they described an arc in the air, crossing one another and slicing him in three before returning to their owner. Katon switched the blades off and holstered them. He slowly approached the remains of the assassin and crouched, examining them carefully. His fingers traced the mangled armor’s pockets down to the midsection, then turned the upper body around and produced a small disk from a hidden compartment. The young man didn’t respond. He continued his search for a few moments more then finally stood up and faced the red armored Darth Marr. He was as impressive as his reputation foretold, and just his presence emanated the pure might of the Dark Side. He examined the young man who didn’t appear to be nearly half his age, let alone built as a tank as he was. He didn’t carry himself like a Juggernaut, nor did he wear the light robes of the Sorcerers or the Assassins. “Do not test my patience, Marauder,” the Darth said harshly. “I will not ask again, but let my saber do the talking,” he added, resting his gauntleted hand on the hilt of his weapon. The Darth looked at the him from behind his terrifying helmet and pondered the words. More exactly he analyzed the way they felt inside him. He nodded. Before he could finish, Katon tried to walk past him and leave, but in the blink of an eye Darth Marr flourished his saber and blocked his path with the red laser blade. Katon turned and looked Marr in the eyes, his mixed yellow-green gaze piercing through the helmet. He smiled knowingly. “I did,” he answered and walked away as the Darth suddenly removed the weapon from his path.